Lori Gendelman, Dr. Judith Reichman and Eddy Taylor. 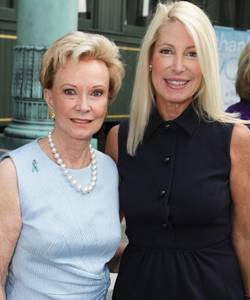 PALM BEACH, FL– The co-inventors of a blood test used to detect ovarian cancer joined 225 guests at The Flagler Museum Pavilion for the 12th annual H.O.W. “Time is of the Essence” luncheon. Lori Gendelman and Eddy Taylor chaired the program. 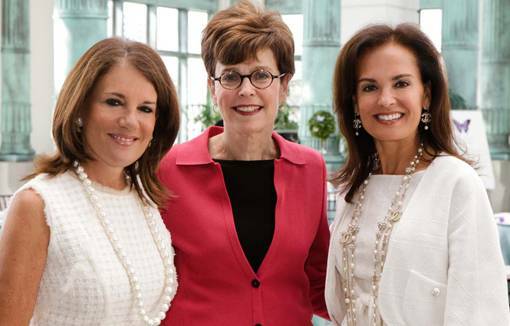 Anita Michaels, Ann Candido and Cobey Rapaport were honorary chairs. Dr. Robert C. Bast, vice president for Translational Research at The University of Texas MD Anderson Cancer Center, and Dr. Judith Reichman, a bestselling author and long-time medical contributor on the NBC Today Show, were guest speakers. Barbara Banks, who is currently living with Stage IV ovarian cancer, shared her story of survival. Also attending the luncheon was Amanda Abrams, who was only 22 years old when she was diagnosed with Stage II ovarian cancer. Abrams was helped through the H.O.W. Jacquie Liggett Angel fund and completed chemotherapy a few months ago. Proceeds from the event, held Jan. 28, 2013, benefit H.O.W., Hearing the Ovarian Cancer Whisper. 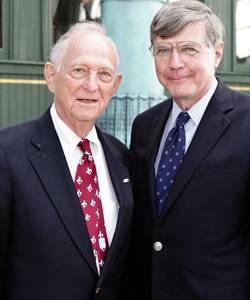 Bast, along with Dr. Robert Knapp, who also attended the luncheon, co-invented CA-125. The blood test was developed in 1981 and is still the most accurate test for ovarian cancer. At the luncheon, Bast discussed the significance of the test and updated guests on research in ovarian cancer. Reichman is a practicing gynecologist in Los Angeles and specializes in perimenopausal and menopausal care. She is an attending physician in gynecology at Cedars-Sinai Medical Center and a Fellow at the American College of Obstetricians and Gynecologists. Major sponsors of the luncheon were Wilmington Trust and Betsy K. Matthews. Silent auction sponsors included Betteridge Jewelers, Chanel, Neiman Marcus Palm Beach, Tiffany & Co. and Van Cleef & Arpels. H.O.W., a program of Palm Healthcare Foundation, Inc., is a nonprofit group founded by the late Jacquie Liggett. It raises money for research and educational programs, and offers financial assistance to women in need through its Angel Fund. About 22,000 women are diagnosed with ovarian cancer every year and 15,000 of them will not survive. For more information, call (561) 837-2285 or visit www.ovariancancerpbc.org or www.palmhealthcare.org.